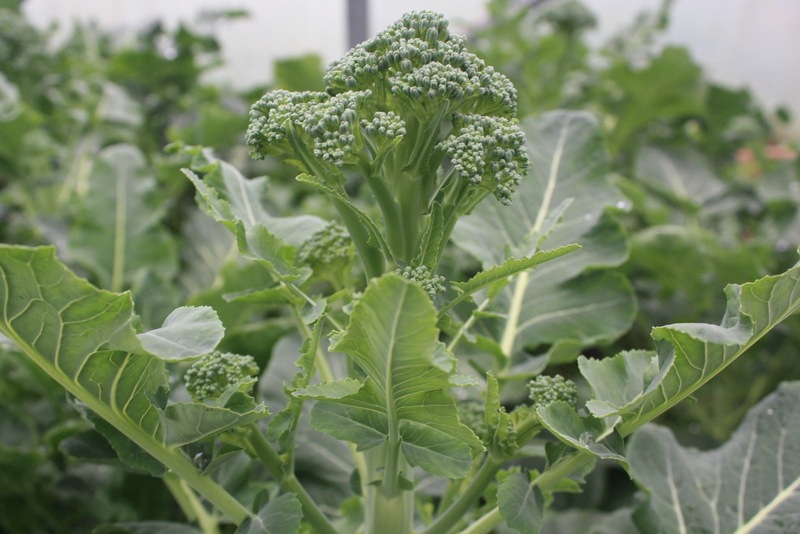 Polytunnel crops at the moment. Due to popular demand (that sounds cliched but it's actually true) as of Tuesday 8th March we will be introducing a new volunteering session here on the farm, every Tuesday afternoon from 1 till 5pm. As I type this, the sun is streaming in through the office window, and hopefully this will continue, because we have a lot of vegetable beds to prepare and sow out on the vegetable field - this should be the main activity through March and April (especially now our work on the outbuildings and tree-bogs is almost complete - many thanks to the 6 volunteers who came on Thursday, and everybody else who has lent a hand over winter). As always, the more people who come the more enjoyable it is for everybody, the more we get done, the more we learn, and the more food we can produce on the farm, so see you here! Wildflower discovery walk - to be held Weds 16 March. On Wednesday March 16th, at 5pm, we will be leading a wildflower discovery walk around the farm, to see what spring flora has popped up so far this year. Attendance is by donation, and there will be the opportunity to buy various farm produce. We hope that this will be the first of several such wildflower discovery walks through the year, and as the evenings get lighter we'll arrange them to take place later in the evening. Meet in the farmyard for a prompt 5pm start. 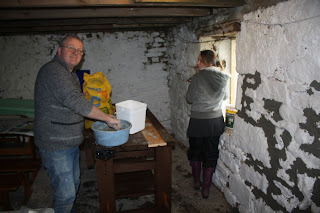 Yesterday we finished off painting the outbuildings, and afterwards we decided to drain the plastic cattle-troughs to move them indoors out of the weather (we have no cattle, as yet). 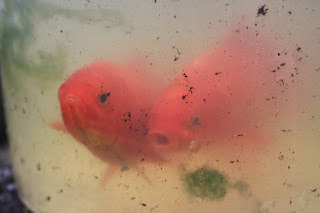 Over the winter I was sure I'd seen two goldfish in one of the troughs, despite the at-times two-inch-thick ice on the water, and as we drained the trough we eventually found them, fished them out, and popped them in a bucket. They seemed healthy, and were of good size, so one of our volunteers, Kent, took them home with him to release them into the pond in his garden. He christened them Lucky and Luckier, though they're difficult to tell apart! 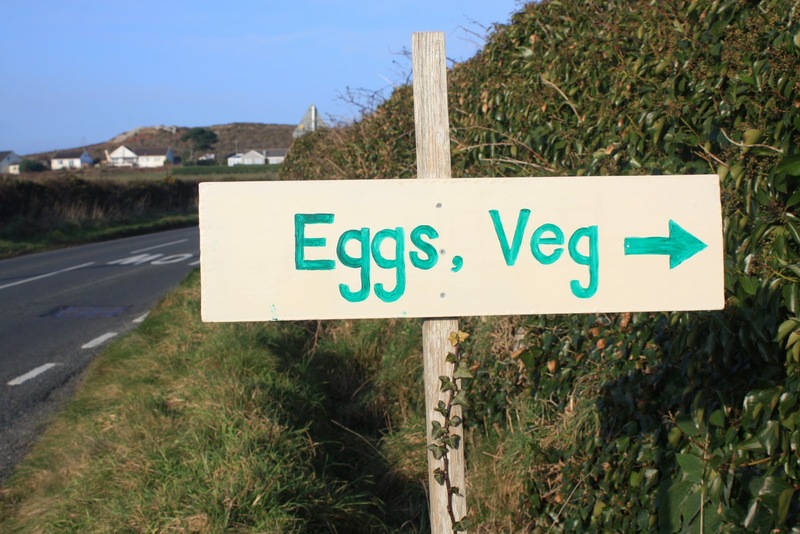 and 4) The Egg Packing Room, as a hygienic dedicated egg space. Stuart, Kian, Adam and James painting the Hive ceiling and beams. As well as our own volunteers, the RIO trainees came along for another day to help us out, so thanks to them and the RIO team for making it happen. The Hive ceiling is now all but finished, just a few finishing touches needed here and there, and it is now less drafty and has a hook-and-sneck on the door too. Bo painting designs onto the egg packing room walls and door. 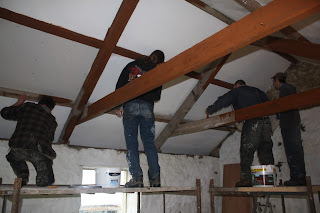 The egg packing room has also come on by leaps and bounds, and now only needs the painting finishing off, and the electricity and water supplies reconnecting, before the job is done. Bob and Deb cementing gaps in the workshop. The downstairs workshop now has a stronger ceiling, new window, work-bench, shelves, and less gaps between the stones, but needs more cement and more paint, plus a good tidy up, before we can move the tools in out of the kitchen cupboard. And with the ground outside saturated from this morning's torrential storm, a lot of these jobs could get finished tomorrow! Composting workshop with St. Just Primary school. On Wednesday 2nd February, a group of pupils from St. Just Primary school came down to the farm to learn about composting, and to tie this in with their classes about gases. As usual, the high-point of their day was being introduced to our very friendly chickens, but they also learnt about nitrogen, carbon, oxygen, and water, and how they play their parts in the composting process. School group learning about composting. 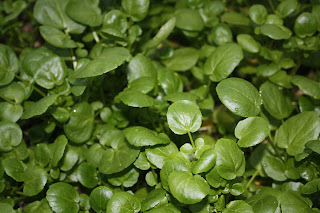 Would anyone here put tea-bags on their compost heap? 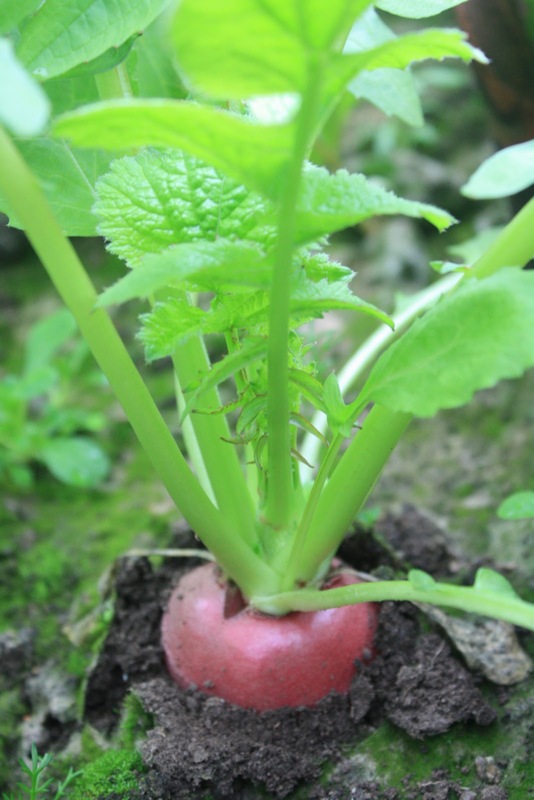 Compost is a wonderful thing, a way of making something from nothing, and of making our organic vegetables tasty and healthy whilst maintaining soil fertility. 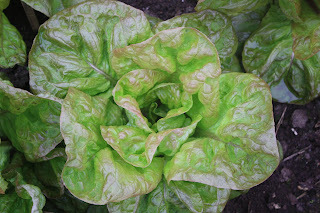 During the compost workshop we discussed different ways of composting, and what can go on the heap - tea bags yes, plastic bags no, horse manure yes (but better kept separate and put on your potatoes), autumn leaves yes (but better transformed into leaf mould) - and then we went and had a look at the finished product. Lovely compost, full of organic matter. The school visit was reported in The Cornishman the following Thursday. As the friendship and cooperation between Bosavern Community Farm and St. Just Primary School continues to develop, the school donated three apple trees to us, which we have planted (and composted with the above) in a corner of Home Field, to provide shelter (and apples) to the site where the school are going to develop their own vegetable and fruit growing area. Work will begin on this next project once the ground is dry enough for digging. On February 1st the eagerly anticipated willow coppicing day with Greg and the Wild Penwith Volunteers arrived, as did 14 pairs of helping hands. 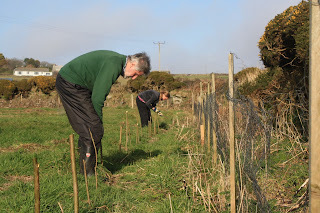 The idea was to coppice the back row of willow along the south side of our vegetable field, sort the cuttings, and re-plant willow along the east side of the field (to reduce those strong easterly winds) and around our new tree-bogs (to convert waste into biomass). 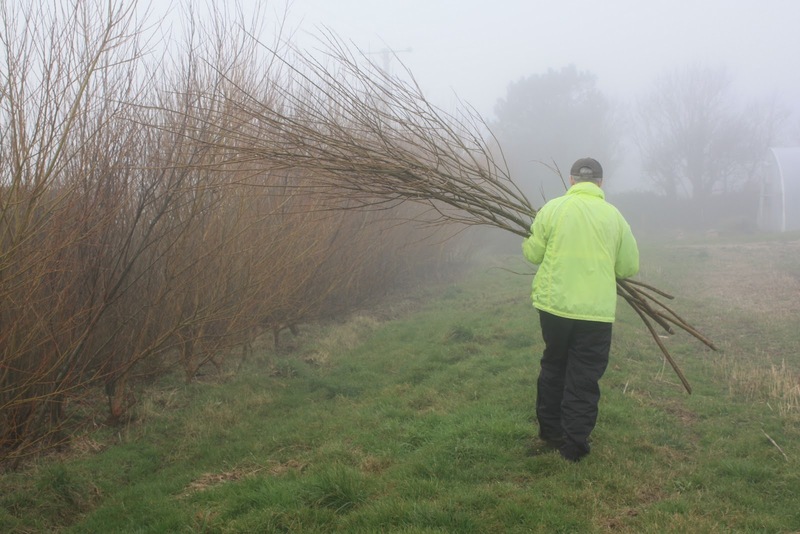 Carrying coppiced willow on a misty morning. Greg demonstrated how to cut down the willow without damaging the tree unnecessarily, and we split into pairs to do the work. Then he introduced us to the traditional art of "snedding", that is, cutting and sorting the willow into various thicknesses for different uses - short thick lengths for replanting, long thick lengths for green wood-working, medium-thin lengths for weaving, thinner lengths for weaving, and the rest for scrap or for burning (drying to make faggots). 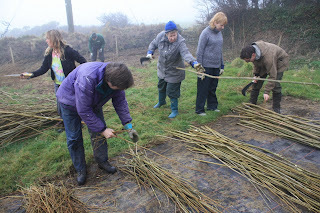 Sorting the willow into various sizes. Snedding as a group activity. As with most traditional crafts, there is more to coppicing than just cutting down trees to get rid of them. 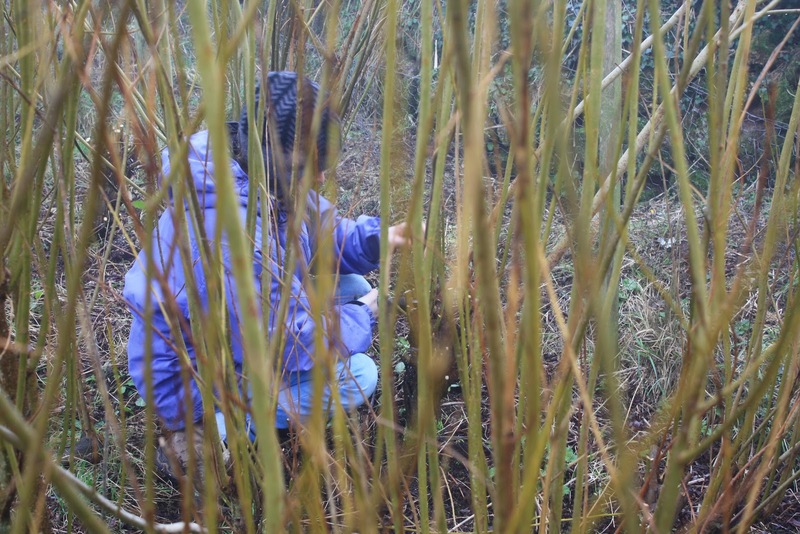 Willow not only provides a valuable windbreak to protect crops and livestock, it is a valuable crop in its own right, and can be used to weave baskets and lobster-pots and fence panels, or made into chairs and benches. We hope in the near future to hold a weaving event here on the farm, with workshops and products for sale - watch this space for details. Planting willow along the field edge as a windbreak. After planting three parallel rows of willow along the east of the vegetable field, and a circle around the tree-bogs, we had just enough left to plant a single line along the west of the field behind the compost bins, to give extra protection to our crops on this very exposed site. This is just the beginning of our willow management plan, and we will be coppicing this time every year. 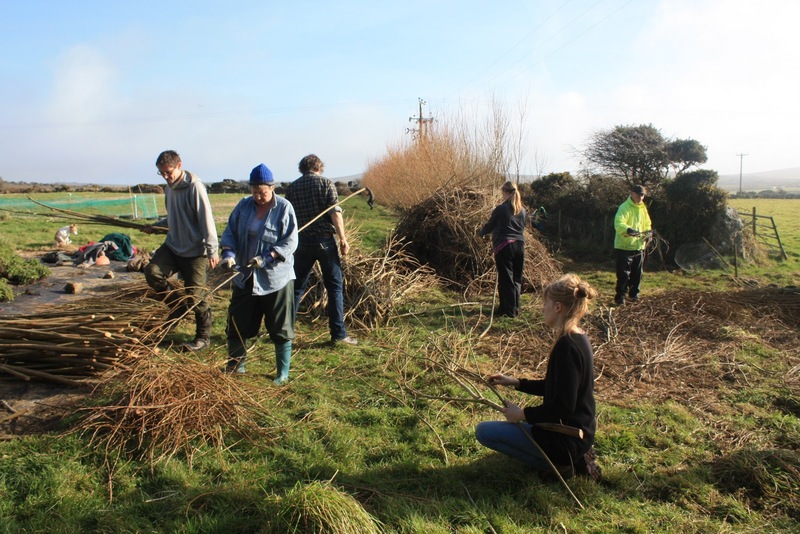 Thanks to Claire from Cornwall Wildlife Trust, the Wild Penwith Volunteer group, Bosavern Community Farm volunteers, and to Greg for leading the day. 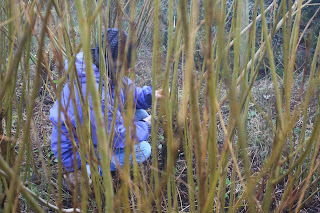 Jessica hiding amongst the willow on our coppicing day. 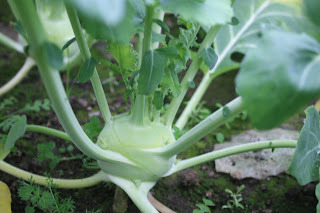 Many thanks to Jessica, who came to us through the Willing Workers On Organic Farms scheme (see their website www.wwoof.org.uk and our older post from December 2010). 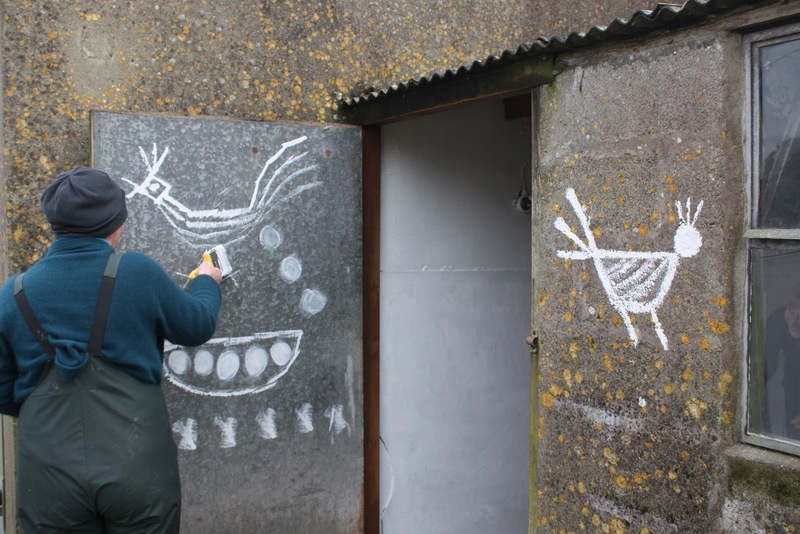 Jessica stayed with us for two and a half weeks, working as a volunteer on the farm, and put in a lot of effort, especially in preparing the second chicken shed for use. After an article appeared in the Cornishman (thanks to Ellie Evans) we have had a sizeable donation of tools, including hoes, spades, and wire netting. Many thanks to the lady from Sennen who called to say she would drop them in - they will be very useful. 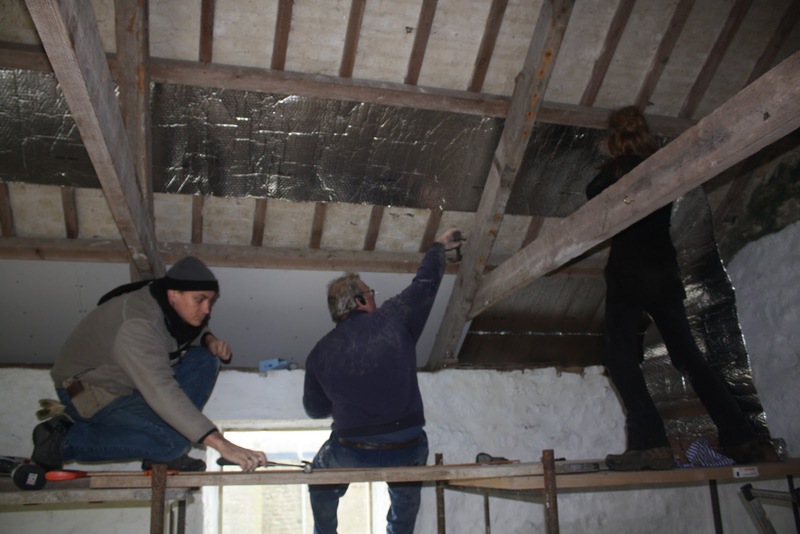 Saturday was a cracking day on the farm, with fourteen volunteers coming along to work on the project, so a big thank-you to all of them. Fran and Alice set off early to set up and run the Bosavern Community Farm stall at Pendeen Farmer's Market, where they sold out of eggs and vegetables and made almost £60, all of which will be used to improve the farm and outbuildings. Terry, Bob, Kent and Jessica got started on fitting a new insulated ceiling in "The Hive", and by the end of the day two-thirds of the ceiling was up. Kent, Terry and Jessica putting up the new ceiling. In the afternoon, the rest of us got out into the windswept vegetable field and dug two and a half vegetable beds, removing weed roots as we went, which is a great effort and another step towards cultivating the entire field. And while we were enjoying ourselves digging, Linda and Alice cleaned out the chicken house and collected eggs. A busy day indeed, and we look forward to many more! Vegetable beds progressing gradually across the field. On Friday 4th February we were privileged with a visit from Mark of Trevalon Organic Vegetables in South-East Cornwall. Mark does an amazing job growing organic vegetables and supplying a vegetable-box to over 80 customers, and came here to share his experiences and wisdom with members of Bosavern Community Farm. We spent 5 hours chewing the cud, including a windswept walk around site, and came away with many answers and many more questions. 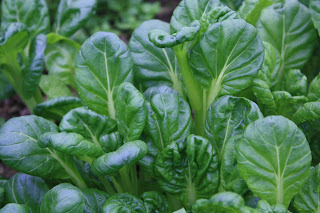 Such as - should we try to grow everything here on the farm, or should we grow as much as we can and buy produce in from other organic producers in the local area? If anybody has a view on this please let us know, we'd love to hear from you. Many thanks to Mark for taking the time to come and visit us, and to the inspiration he has instilled in us. The Trevalon website can be found at www.trevalon.co.uk. Also thanks to the Federation of City Farms and Community Gardens (www.farmgarden.org.uk) for donating 50 canes of Autumn bliss raspberries! 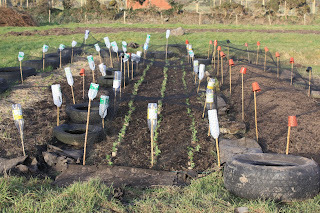 We'll plant them before the end of the month, and if anyone wants to lend a hand please phone Hugh on 01736 788454. 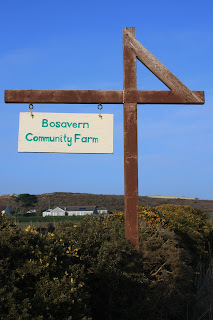 Bosavern Community Farm is now unmissable with our new signs on the main road. Thanks go to Bosavern House Bed and Breakfast for allowing us temporary use of their gallows-posts, to our volunteers who helped make the signs, and to our friends who donated the paint. One of our regular volunteers, Lela, has just left Cornwall to go and forge a new life for herself in another part of the UK, and so we'd like to say thanks for all her hard work over the past few months, and we wish you all the very best.